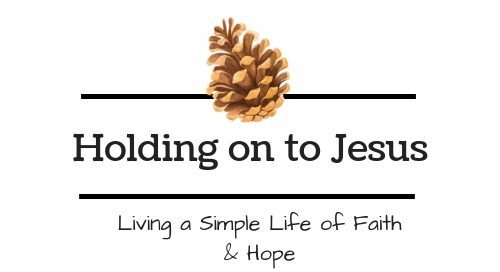 Welcome to Holding onto Jesus! My name is Brenda and I am so glad that you are here. If you are looking for a place to come and find encouragement and hope; if you want to learn how and what to pray for; how to keep going when chronic illness brings you down. If you want to learn how to how to forgive yourself and accept the grace and love that Jesus is holding out to you, how to accept yourself as a daughter or son of the King then this is the place to be. My goal is that my posts will lift you up, inspire you, show you how to fight with scripture and use the power of prayer. I am hoping to instill in you the importance of a continual deepening of your relationship with God through the reading and studying of His word. God has given me a passion for helping people, encouraging them, wanting them to feel loved and accepted. I want to see people grow in their prayer life, to really help them see all what needs praying for. I want you to come to realize what a powerful weapon praise is and not just spiritually, but emotionally and even physically. Having lived with multiple chronic illnesses for more than 25 years, I have been through both the highs and the lows, the continuous circle of side effects your meds can run around you. Feeling useless and worthless. I was first a wife with chronic illness and then a single mom with chronic illness. Talk about feeling like a failure! But God brought me through it all and the journey isn’t over yet! Then few years ago I started another journey, of finding what grace really meant. That journey has brought me to new and fuller understanding of my worth through the eyes of God. What an amazing discovery that has been. I hope to share it with you. I share my home with two precocious cats Matty and Silas. Matty drools when he’s happy and content. Silas loves to do his version of the side stroke across the carpet. They sure keep me smiling. Once again, I thank you for stopping in. I pray I can be used to help you come to understand just how precious to God you are. How He wants so much to help you on this journey we call life. How He wants you to be able to live it with joy. And who knows where we will end up if we share this together. Won’t you join me? I continually marvel how God brings people together even if it’s on the internet. Grace and peace my friend. I am amazed at how He works like this. I pray continually that the internet be used for His glory and for helping others. Your writing is a blessing. I can FEEL God’s grace in your website! Blessings!!!! Thank you! It is all God’s work. I came to visit and leave a follow since you left me one today. Thank you. I will enjoy our blogging friendship I am sure. Thank you. Always a great thing to find a fellow believer. Any posts or comments made by me are my own views/beliefs. Any suggestions or advice given are not meant to be taken as professional medical advice or any legal advice.